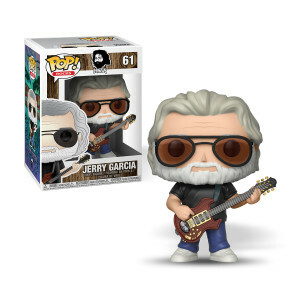 The Jerry Garcia Pop! Rocks is part of Funko’s newest wave of the Pop! Series. 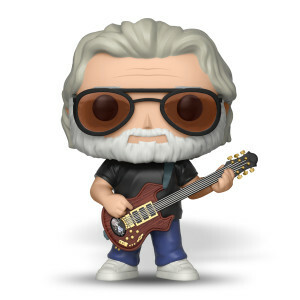 Featuring Jerry’s iconic guitar, Rosebud, figures stand at 3 ¾ inches tall and weigh 4 oz. Missing finger, cant ask for more never had a pop up even though i worked next door to Funko. Got Jerry as gift for my son. He absolutely loves it! Lil’ Jerry will stand by all my Jerry stuff, in the “Dead corner” of my music collection, &amp; with all the other guys solo stuff &amp; the Dead.?? Very prompt shipment and helpful staff. "All good things and all good times"!! Got the little Jerry. It's awesome. Reminds me of an alternate world and puts a smile on my face. Thanks Jerry! Miss you! I’ve been looking at the little Jerry for a while. He sits on my desk and watches me draw and paint. Wonderful addition to my collection! Wonderful company to order from. Worth every penny, even non-Deadhead wife loves it. All good things in all good time! I don't think you'll find a better groome Jerry Garcia anywhere. Knockin' on Heavens door! Love the little Jerry!! A fine addition to my humble abode. So awesome, I bought a couple more and sent them to friends!!!!! This rocks! Even better the artwork on the box is by AJ Mashtay. Very well made and great conversation piece. Very excited about this purchase. This is one of the most awesome collectables that I have seen in a long time! The detail on this little guy is fantastic, I mean right down to the missing finger. I couldn't have asked for a better gift - to myself! Thanks for putting this out there...i have received nothing but favorable comments. jerry, in a Funko Pop!! Who could have imagined the joy. I bought 2, one for keeps and one for a friend. Got a great SMILE in return, great way to have a great day!! Enjoy!! This is one great addition to our collection. So glad we got 2, so we can play with one, and keep 1 in box to display. Came in fast and in great condition.